Striker Elliot Lee felt Town’s fast start at Yeovil on Saturday was absolutely crucial as they went on to record a first away win since late January. After conceding early on in their last three away games, taking two points from a possible nine, this time it was Luton celebrating when Lee raced away to finish smartly from Danny Hylton’s flick. Lee felt Yeovil, who were reduced to nine men before the half hour mark, would always struggle once the deadlock was broken, as he said: “We really put an emphasis on we’ve got to start well as if we start well and get the first goal, then not many teams will come back at us. 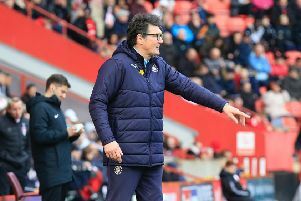 “So we did that brilliantly with our start, two early goals, but it was a brilliant first half even without the sendings off and we’re all really happy with it. “We’ve conceded quite a few goals in our last few away games early on, so we wanted to start well and I think we did that with my goal. We’ve conceded quite a few goals in our last few away games early on, so we wanted to start well and I think we did that with my goal. Defender Jack Stacey was impressed, but not a bit surprised by the manner in which Lee found the net, as he also highlighted the important of Town’s opening 10 minutes. He said: “When he’s come in, he’s done really well and that’s sort of a trademark Elliot Lee finish, opening up. “He does it in training all the time and I’m glad he could do it in the game. “The first 10 minutes were massive, to stop any threats they have as we have conceded early. “After that, once we were in control of the game, it makes keeping a clean sheet easier because we can keep the ball, play our own game and keep the ball away from our net. “The whole team wanted to start on the front foot, to see if we can get behind them early, and that’s something we did. “It allowed us to then have a bit more space to play our game. Town did go on to add more goals through Danny Hylton’s penalty and then a close range finish, as Lee continued: “Credit to Hylts, he’s very good at that. “He’s dinked his last one and now he’s put that one in the top corner. Meanwhile, Stacey said: “They watch the penalties and Hylts has changed it. Cruising at half time, with a 3-0 lead and their opponents down to nine men, Town played the second period at a much lower tempo, content with what they had, as Lee added: “We all found it a bit frustrating, but we’ve played a professional game. “Sometimes you find yourself forcing it, I know there’s nine men, but they keep compact, so there is very little space as they did stay so deep. “It did at times get frustrating and it gets boring just passing it around the back.